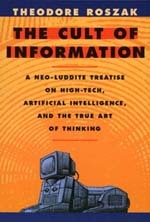 As we devote ever-increasing resources to providing, or prohibiting, access to information via computer, Theodore Roszak reminds us that voluminous information does not necessarily lead to sound thinking. "Data glut" obscures basic questions of justice and purpose and may even hinder rather than enhance our productivity. In this revised and updated edition of The Cult of Information, Roszak reviews the disruptive role the computer has come to play in international finance and the way in which "edutainment" software and computer games degrade the literacy of children. At the same time, he finds hopeful new ways in which the library and free citizens' access to the Internet and the national data-highway can turn computer technology into a democratic and liberating force. Roszak's examination of the place of computer technology in our culture is essential reading for all those who use computers, who are intimidated by computers, or who are concerned with the appropriate role of computers in the education of our children. Theodore Roszak is Professor of History at California State University, Hayward. Among his many books are The Voice of the Earth (1992), Flicker (1991), and The Making of a Counter Culture (1969).